Manchester's Club Academy could easily be mistaken as the venue for a Secondary School Dance as it is flooded with giddy teenagers drinking red bull and wearing topshops latest trends, waiting to see their favourite UK pop punk band You Me At Six. Tonight Is Goodbye have entertained Manchester audiences only on a few previous occasions before, but with their name appearing in Kerrang more regularly and gaining spots on rock festivals around the country their popularity is growing all the time. They open their set with 'you and your tune' and song which is bursting with energy and pop hooks galore which unleashes a brilliant sing a long chorus. An old favorite 'noughts and crosses' and new comer 'fire in the hole' sound bold, and their are moments of their verses which could be found in pop outfits likeMaroon 5, showing off the 5 piece's song writing talent. The more recognised 'Criminal' is thrown into the set where frontman Ant West starts to get the crowd involved in the songs gang vocals which echoes’ through its chorus. The end to Tonight Is Goodbye’s set is superb, as they save their best till last with super slick catchy new single 'brain' before finishing with 'Black Dress'. The single from their Birds & Bee's cd gets the best response from tonights crowd to the southern band as their onstage energy blows into overdrive.Tonight Is Goodbye are very very impressive but also wasted on the audience as the maturity of their songs are slightly wasted on this very young crowd. Musically some of the guitar work and hooks thrown between their pop verses is of a far higher caliber than You Me At Six, but this is simply not recognised tonight.With the right crowd who can appreciate exactly what Tonight Is Goodbye can offer, the band can go far in the UK scene. 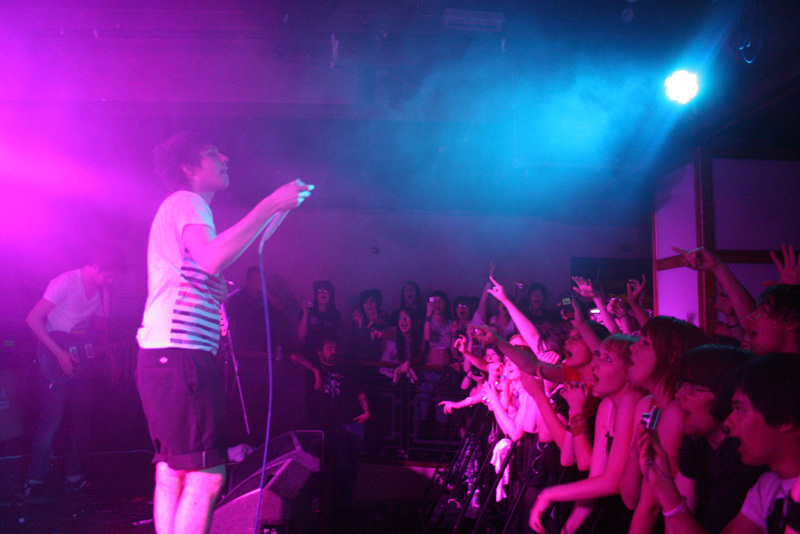 The Manchester Club Academy date was You Me @ Six's first sold out show of their July tour and when the five members appear onstage, the 500 or so teenagers who have had their tickets for months create a welcome of screams and cheers. The band who must only be one or two years older than their secondary school aged audience burst into 'Jealous minds think alike', a song from their forthcoming debut album. It doesn’t seem to matter that the song hasn’t been heard as much as other songs, the poppy and bouncy opener goes down a treat. Their second on the other hand is being rotated across several musical channels after its video was released two weeks ago. 'Gossip' has been on the bands myspace for over a year or so with its brilliantly catchy melodies found in the songs introduction and chorus has the crowd going wild and repeating every line that frontman Josh has to offer them. 'You’ve made your bed' is another one of the bands song that has been knocking up thousands of plays on their myspace over the past year or so. With this being a few songs into the set, the sound levels have set in and you can appreciate the bands guitar work in their more popular songs, although overall the bass could be turned down slightly, but this is nothing more than an ever recurring glitch at any live rock show. Another fan favourite 'if I was in your shoes' goes down perfectly. Frontman Josh informs the crowd he needs help with his vocals from his audience due to illness and they are happy to accept the favour. The song throws out a more rocky sound than their normal US influenced pop punk, but like so many of You Me At Six's songs, it involves a superbly catchy chorus. The new material which is previewed between the bands favourites tracks sound promising that their new album will be a success. It has a more melodic sound which reminisces with bands in their genre like Valencia and Just Surrender. 'If you Run' particularly shows great promise and is more than likely to be a set favourite in late 2008. When the repeative octave note of 'save it for the bedroom' starts to ring out, the crowd know exactly what to expect and you can see their eagerness for that first line to start so they can sing along. The song that was released late last year really propelled You Me At Six into the Limelight and the pages of Kerrang, and you can tell it means a lot to both the band who perform it with a huge amount of energy, and their fans who echo every line back. The night is rounded of with the bands most favoured final song 'the rumour'. Arguably their best song, its structure is brilliant, a bass lead verse with little intricate leads weaving in and out before a sing a long chorus which is again their most impressive and catchy. The sound in the Club Academy feels its biggest in the rumours outro as its ending really does fill the whole room as it climaxes with pure energy. You Me At Six's hundreds of teenage fans rush to the merch stands with huge grins on their faces hoping to catch a glimpse of the band at the end of their performance. Its obvious they’ve had a great time and its something that will be discussed through out school on Monday morning. They will also be waiting eagerly for the bands debut album which will be released in October combined with another UK tour. From tonight’s performance, another sell out Manchester show is 100% on the cards.